The Associate District & Magistrate Court Team is a key member of the team who plays significant role in drafting most pleading under guidance of senior members of the team. He/she plays tremendous role in maintaining integrated court schedule in an encrypted platform of the Chamber accessible by all the members. Besides the person also regularly provides legal opinion, vetting & other work which are related to the assignment of District & Magistrate Court Team. The person also maintain liaison with the client & prepares monthly statement for clients regarding pending works at District & Magistrate Court. Ms. Shakina Akter completed LLB from University of London (UK) & LLM from Northern University of Bangladesh. Ms. Akter has substantial experience of corporate, contract, Business, Civil, and Labor Law. 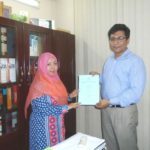 As a member of District court Team and also as a Member of Dispute Resolution and Finance Department, Since joining Ms. Akter proved her integrity and immensely assisted the firm with few major assignments involving drafting of several writ petitions and vetting and preparing several banking and finance related agreements, security documents. As a district court team member she regularly keep liaison with clients and coordinate the work between client and other team member. Drafted writ petition involving several clients over Banking and Finance matters. Drafted plaint & Injunction Application for Saturn Textiles Ltd, in a matter related to fraudulent L/C documentation against Damuder Textile Ltd. Prepared due diligence report for Maruhisha which regard to acquisition of land Narayanganj Export Processing Zone. Drafted Written Objection for Maersk Bangladesh Ltd in a title suit pending before District Court Dhaka. Successfully prepared a research project on Business Laws of Bangladesh for Union Resources & Engineering Company.